I am working really hard on ramping up my miles and building my base. The weather was also awful this week – I welcomed the rain because of our drought, but I am ready for it to even out now. I am calling it a rest day, but for anyone who has ever spectated at or participated in a triathlon, you know it was anything but restful. We had to be at the venue at 6:15 so that little man could put the rest of his gear in transition. He didn’t start until a little after 8:00 AM, so it was a lot of driving and waiting. Once he started, it turned into a lot of sprinting around for me and Mr PugRunner – we were able to watch him at the pool, walking his bike in and out of transition, the end of the bike course, and the entirety of his run. He did so well and we are so proud. When we got home, we honestly just wanted to chill but some buddies invited him to the pool for a bit, so of course, it was back in the water. And then, I am fairly certain we just watched movies and chilled. It was a long day. Little man and I headed out for our mile, and the rest of the day was pretty normal. Mr PugRunner took little man to work and then to karate that evening. Little man has been consistently taking karate classes for the last four years and has been talking about needing a break for the summer. We don’t mind – we had opted to have him forego karate camp this year in favor of some other things he wanted to try, but we had asked him to discuss with his sensai before putting things on hold. In the course of that conversation, he was invited to test for his first advanced belt (!) so he will continue with his classes until this upcoming Saturday, test, and then resume classes when school starts. it’s amazing how far he’s come. The weather had been awful – lots of rain and thunderstorms – so I ran close to home, just in case. I made it through a very wet and drizzly five miles, and then got ready for work. I was not amused with the all day downpour, and was even less thrilled with the tornado warnings sounding my entire drive home. Fortunately, the storms headed out to sea without doing too much damage. I went out to dinner with some of my neighbors – it was a lot of fun, and it’s something I hope we can do more. Happy Global Running Day! I got the whole family out for a run! Whoo hoo! After spending two days at his dad’s office while I was at work, little man finally got a play date with his bestie. I think he was happy to have someone to play with, as opposed to entertaining himself at work. This was a yucky, rainy, miserable day. Boo. To be honest, I wasn’t really feeling too motivated to do much of anything, so we stayed in our PJs and lounged. These aren’t my favorite days, but sometimes, they are necessary. Little man had been BEGGING me to make slime, and I had finally gathered all the ingredients. So we made glitter slime and smooth slime, and he was just the happiest kid on the face of the planet. At long last, the weather was clear. I got a bit of a late start and the boys followed behind me on their bikes. They had almost caught up to me, when little man lost the pedal on his bike. I helped try to get it back on, but we couldn’t figure it out, and so they ended up having to walk their bikes home. We agreed to look at it over the weekend. That afternoon, my parents came over and we ran a few quick errands before going to our historic downtown to hide our kindness rocks. We also found four rocks that others had painted and hidden! We rehid those as well, and then celebrated our efforts with ice cream sandwiches from Piece Pie. My parents also stayed for the Cub Scouts’ Raingutter Regatta. Basically, it’s a more casual version of the Pinewood Derby – scouts build catamarans out of balsa and precut sails and then race them in water-filled plastic rainwater, by blowing on the sails with plastic straws. During their non-racing times, they took a water safety lesson, learned to play badminton and made fidget spinners out of hot glue, all of which will earn them badges and belt loops. Little man went undefeated in every round, and won first place for the entire event! We couldn’t believe it! He was absolutely over the moon and is excited for his next summer activity. We slept in a bit, and hung out around the house. After lunch, Mr PugRunner took little man to one of our local bike shops to get his pedals fixed, and I tried to take a nap. That evening was Run For The Pies. It’s a crazy fast and popular 5K – the early race is for the male and female qualifying elites, and the later race is the open, where the first 200 people win a pie for crossing the finish line (if they do so under the time constraints). I had absolutely no chance of winning a pie, but I had never run this race, so I was ready to give it a try. Race report to come, but it was a blast, despite the fact that it was at night and humid and muggy as all get out. Almost 15 miles this week, so that felt really good. I want to get back on my bike, now that the rain has stopped. I’m really nervous about riding on slick, wet roads for some reason. Camps are starting up this week, so we shall see how my schedule works out as far as training. My next race is looking like the Celebration 5K on July 4, and I am excited to feel a little bit back in a 5K groove. Is the slime craze a thing near you? Great job this week. I hope the weather improves for you! I would also be really nervous to bike on wet roads. It’s supposed to rain pretty solidly for the next few weeks. Boooo! Shockingly, it wasn’t as gross and messy as it seems. We actually had a lot of fun with it, and it’s keeping him occupied on rainy days. I know I say this all the time but I just love how you keep so active as a family. It’s really fabulous that you are instilling those values so young. I hope he keeps up with them throughout his life. I remember being such a non-active kid. My family just wasn’t into it and I wonder if it would have mattered if we were all involved. I guess we won’t know until he’s all grown up and moved out! Congrats to your little man! I wish I had that kind of drive for fitness when I was his age. I just love that fitness is a family affair for you! That glitter slime looks so cool – would it be weird for an adult with no kids to make it? LOL I just love fun projects like that! 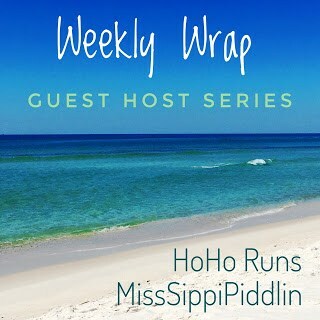 Thanks so much for linking up for the weekly wrap! I don’t know if it’s a drive or he likes trying new things. Or peer pressure LOL. I don’t think it’s weird at all. Once you get past the initial luckiness of it, it’s actually pretty cool to mix up and play with. Look up Gillian Bower on YouTube for some really good recipes, if you’re interested. Wow, what a great week for your son! I know you’re so proud of him. Slime is a thing, but my kids are grown. Your batch looks so cool though! The weather has been a huge downer here, too. Can we talk more about this slime? How did you make it? I’ve heard that you Florida folks have been getting a lot of rain. Another great week! Congrats to little man on being an expert boat builder! The run for the pie sounds super fun! I think they should award the last 10 people with pies too. Those of us bringing up the back could definitely use some pie! What a week for you and your family! That’s so awesome that your son did a triathlon! I’m actually hoping to get my girls into one locally. And congrats to your son for his first place – that’s awesome. How fun that you made Global Running Day a family affair. Physical activities with family are always a lot of fun. My younger son made a few batches of slime, but seems to have gotten over it. You guys have been busy! Congrats to little dude on the tri! Awesome job to your little man on his triathlon! That’s amazing! I love how y’all ran a mile as a family for National/Global Running Day! It really was a fabulous week. I can’t believe he won the boat race! All week, every week LOL! I am trying to keep us moving this summer. Mary Beth Jackson recently posted…Let the Utah Valley Adventure Begin!!! I know. I love pie.